If a tree becomes unsafe or undesirable in your yard, our experienced team will safely and efficiently remove it. Dead or dying trees can often become a breeding ground for harmful insects and diseases, so it is advisable to remove any such trees from your landscape. Forest Keepers is dedicated to safety, and we are fully licensed and insured for your protection. We strive to implement the safest industry standards when it comes to tree removals and we take pride in providing you with fast and safe service. Our dedication to maintaining an injury free environment is a vital part of the way we work. At Forest Keepers we focus on the work practices and training that our men need to keep them up to date and equipped to work as an efficient and safe team. Our commitment results in peace of mind for us, as well as for you, our client. 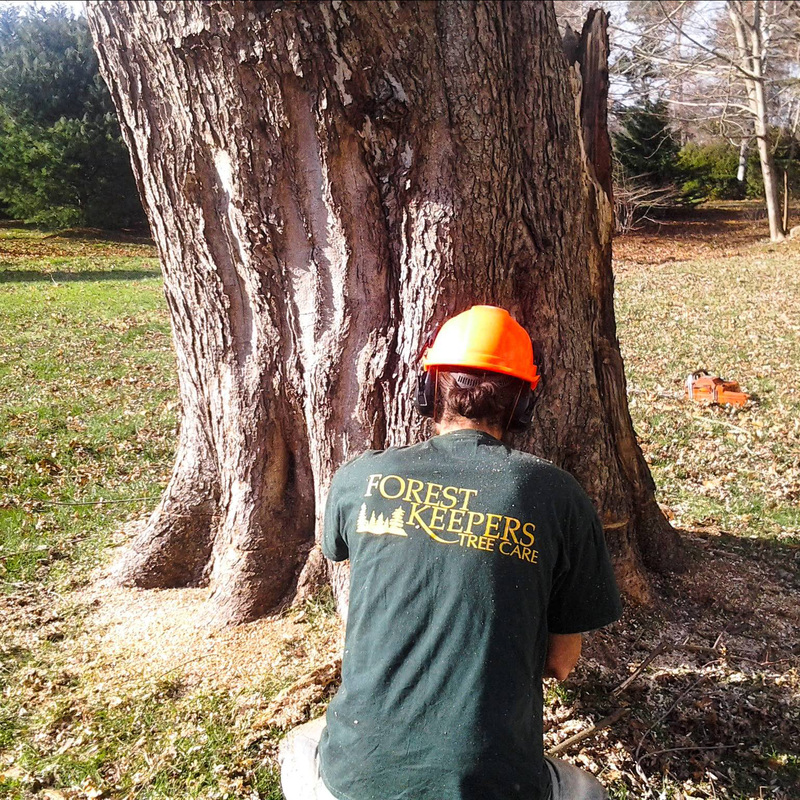 Whether it’s residential, commercial or municipal, Forest Keepers has the experience, tools, and expertise to help you on your next tree removal project. From large or small projects, dead tree removal, or dangerous trees that are about to fall, our experienced team will safely bring them down and thoroughly clean up afterward. We also offer a complete emergency storm response to help you when trees are down that need to be removed in order to repair power lines or damaged property. We know how to work together in a safe manner even under trying circumstances. Why does a tree removal cost so much? Unlike some trades that work for an hourly rate, tree work is unique. It requires a dedicated team of skilled tradesmen well versed in arbor skills. You are not only getting the best industrial arbor care equipment (brush chipper, dump truck, grapple truck, professional-class chainsaws, proper ropes and rigging equipment)… You are also getting a wealth of experience. Literally decades of knowledge and experience stand behind the work we do. So we can safely and effectively meet your tree care objectives — whether fine pruning, tree trimming or reduction, or outright removal. If you need a quote for your tree care project, please give us a call or e-mail us, and our friendly arbor care specialists will be glad to answer any questions. What is the timeline for the completion? What is the approximate cost for tree removal? The total budget may vary as sizes of trees are very different, and hardwood vs. softwood is a factor, as well as how much brush and debris a tree will generate. Proximity to houses, outbuildings, fences, and power lines are also major factors, as it will increase the amount of rope rigging to safely lower limbs to the ground. Larger jobs can also require more manpower and equipment, sometimes even hiring additional crane service. Generally, tree removal ranges from $350 to $5000, all depending on those and other factors.